W ith an award-winning history going back to the 1950s, Aegean Spas are a third generation owned and operated business whose spa and hot tub division was incorporated as a separate company in 1987. Aegean work with swimming pool contractors and architects to design and produce bespoke mosaic hot tubs. Any size and shape is achievable and can be fitted with your choice of wall fittings including jets and lighting. 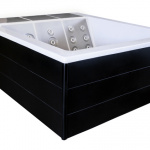 Hot tubs can be fitted with skimmer filtration or why not add a stunning overflow finish. Beautifully crafted and finished in luxury SICIS mosaics, your hot tub will be the star of your wellness space. All hot tubs can be delivered pre-plumbed.